-NZDUSD has responded to a trendline confluence. The trendlines in question extend off of the October and January highs and August and November lows. The reaction is consistent with an important market turn. -.8238 and .8187 are possible reaction areas. New Zealand Dollar pushed aggressively higher against its US counterpart to test resistance at 0.8675, the April 2013 swing high. A break above this barrier aims for the 38.2% Fibonacci expansion at 0.8725. Alternatively, a reversal below the 23.6% level at 0.8639 targets a rising trend line set from February, now at 0.8570. Negative RSI divergence warns of a possible turn lower ahead but confirmation is lacking, suggesting a short trade is premature. On the other hand, entering long with prices squarely at resistance is unattractive from a risk/reward perspective. We will continue to stand aside for now. As the market appears to be finally transitioning out of a relatively difficult cycle from the past month of trading, patterns are also undergoing a period of readjustment. Often, during times like these, certain novel situations can arise, and today's set-up in AUDNZD comes as a classic example of that. The weekly chart below is sporting a clear downtrend, but one that has recently broken a steep declining line of resistance. This is strong evidence that the longer-term momentum is slowing down. According to textbook analysis, price should then rally or consolidate sideways to meet the next declining line of resistance, which stands more than 1,000 pips away. Although the idea of a 1000-pip move is a distinctly juicy proposition, it is best to simply focus on smaller trades. Should price indeed rise that far, traders will be able to ride that move as a matter of course. The bullish bias is somewhat contradicted by the below daily chart, however, which shows a brief recent uptrend has been broken and a lower high formed within the last few days of trading. Classical chart pattern analysis would classify the above pattern as a bearish flag, and a break of this pattern (which has occurred) would be a bearish signal. And normally, this would be true. However, the daily chart also reveals a hidden horizontal line of support (at 1.0748) that could potentially wreck this pattern. As a result of the hidden support line, price has to conclusively break this level to re-create firm bearishness. Thus, there is a distinct opportunity for nimble longs at this juncture. The four-hour chart below offers lots of confluence support, all coinciding within the shaded blue box. There are horizontal support levels, the hidden support line from the daily chart, and the declining daily trend line all contained in this area. 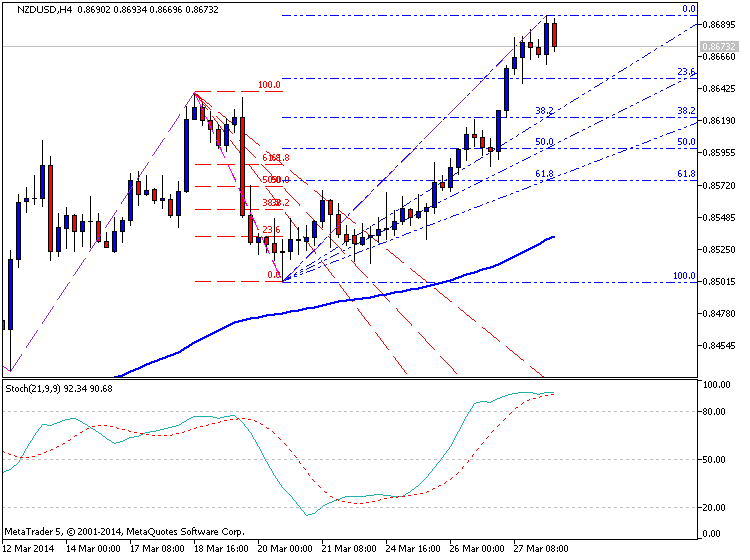 In combination, these provide a support zone of 1.0744-1.0771. This zone is 27 pips deep, which is a very small risk zone for a trade that has literally 1,000 pips or more to move under the most optimistic scenario. The challenge, of course, is the downward momentum currently being exhibited by price. Classical Elliott wave analysts will likely have some bones to pick about the wave count marked on the below hourly chart. However, it is quite likely that price, having already made a momentum move, may pull back a little before making a final charge lower into the shaded blue support zone. The trade would actually be less tempting if price simply charged straight in. Nonetheless, it is possible to take a long from this zone using pin bars, bullish reversal divergence, and/or bullish engulfing patterns on this hourly time frame. As always, two or three attempts may be required, and traders can consider using reduced risk in order to account for the threatening momentum, particularly if wave 3 does charge straight into the support zone without a pullback. The New Zealand may be setting a double top against its US namesake after prices put in a Bearish Engulfing candlestick pattern below resistance at 0.8745, the April 10 high. Near-term support is at 0.8607, the 23.6% Fibonacci retracement. A daily close below this barrier exposes the 0.8500-13 area, marked by the 38.2% level and the October 22 close, followed by the 0.88 figure. Prices are too close to relevant support to justify a short position from a risk/reward perspective. We will remain on the sidelines for now, waiting for a more actionable trade setup to present itself. Even though markets continue to move in spurts, there are still opportunities to be had. Over the past week, market alignment has shown signs of shifting, and hopefully, this will mark the dawn of a more benevolent period. Especially of late, many have commented on the lack of FX volatility, but more interesting is that what is traditionally the most fruitful half of the year has flown by in 2014 with relatively scant pickings. June is typically a low-volatility month as well, and thus, it will be interesting to see if it reverses character and brings some nice trends into play instead. Currently, the pennant on the below daily chart of AUDNZD is interesting mainly because the preferred breakout direction of this trade is down. And, should it turn downwards at this point near the top of the pennant formation, the risk profile for new shorts should be excellent, as a move to the rising support line would contain 260 pips or more. Meanwhile, the four-hour chart below shows price already beginning to flirt with a declining line of resistance that was not clearly visible on the daily chart. Nearby highs and lows readily provide guidance as to a reasonable zone for interacting with price, thus producing an estimated resistance area of 1.0850-1.0878. The hourly chart, however, provides a reason to be cautious. The recent rally into the resistance zone consisted of six consecutive bullish candlesticks. Although price is currently showing some signs of reaction, it is still relatively soon to be making any decisions. Moreover, more active traders may even prefer to enter on the 15-minute chart (not shown), where a clear M-type formation denoting a top might be an even better entry. For those who prefer the hourly chart, however, it would be wiser to wait for a bearish black candle to form, effectively signalling the re-entry of sellers into the fray. Then, let patience prevail and allow the bulls one last gasp to the topside before going in short using bearish reversal divergence, pin bars, and/or bearish engulfing patterns as entry signals. This may play out quickly, with a bearish candle immediately followed by a bullish one, and then another bearish one. Alternatively, it may play out over several candles and not actually trigger until next week. Nonetheless, the formation of this trade is one of the most attractive in recent memory, and as a result, it’s worth two or three attempts at the entry. Afterall, the risk zone is a mere 28 pips deep. NZD/USD could be primed for a further pullback following the emergence of a Hanging Man pattern on the daily. A push below support at 0.8700 would be seen as a bearish signal and pave the way for a retreat to 0.8500. The four hour chart reveals the emergence of a narrow range between 0.8720 and 0.8790. Typically such thin corridors do not persist for extended periods. While a Morning Star formation appears to be forming, the third candle needs to close before offering a bullish reversal signal. The New Zealand Dollar broke downward against its US counterpart, dropping to the lowest level in a week. Sellers are aiming to test support at 0.8733, the 23.6% Fibonacci retracement, with a daily close below that exposing the 38.2% level at 0.8669. Alternatively, a reversal above resistance in the 0.8779-93 area, marked by the May 6 and June 27 swing highs as well as a broken channel floor, exposes the 0.8835-42 region (major swing high from August 2011, July 10 top). Risk/reward considerations argue against entering short with prices trading too close to support. On the other hand, the absence of a defined bullish reversal signal warns against taking up the long side. We will remain flat for now. The New Zealand Dollar dropped for a third consecutive day against its US counterpart, sliding below the 0.87 figure to hit a one-month low. Sellers are aiming to challenge the 50% Fibonacci retracement at 0.8618, with a break below that on a daily closing basis exposing the 61.8% level at 0.8567. Alternatively, a reversal back above the 38.2% Fib at 0.8669 opens the door for a test of the 23.6% retracement at 0.8733. We will tactically opt not to enter short. Next week brings the RBNZ monetary policy announcement, with markets pricing in an 84 percent probability of another interest rate hike. With that in mind, we will remain on the sidelines and look for a bounce to enter short rather than chase the pair lower at present. NZD/USD’s prod back above the 0.8460 mark may fail to find follow-through with a Hammer formation lacking confirmation at this stage. A second successive up-day would help validate the reversal candlestick. However, the potential for a sustained recovery is questionable with significant selling pressure likely looming overhead at 0.8530. The four hour chart offered an early indication of an intraday reversal given the Harami pattern near 0.8420. However, a Doji candlestick denotes hesitation from the Kiwi bulls to push the pair higher. This casts doubt over the potential for a recovery over the session ahead. NZD/USD Technical Analysis: Is a Double Bottom Set at 0.84? The New Zealand Dollar edged higher against its US counterpart after putting in a bullish Piercing Line candlestick pattern, hinting a double bottom may be forming. Initial resistance is at 0.8509, the intersection of a previously broken rising trend line (set from August 2013) and the 23.6% Fibonacci retracement. A break above that on a daily closing basis exposes the 38.2% level at 0.8571. Alternatively, a turn below the 14.6% Fib at 0.8470 opens the door for a test of the June 4 low at 0.8401. Prices are wedged too closely between near-term support and resistance to justify taking a trade from a risk/reward perspective. We will stand aside for the time being, waiting for a more attractive setup to present itself.